With a mature and well managed aquaponics water chemistry, you can grow almost anything you wish. This amazing reality lies in three important factors: your system’s bio-filter, proper pH range, good quality fish feed. The bio-filter simply refers to the nitrifying and nitrating bacteria and the composting red worms (ideally) that reside in your media bed. They in addition to the fish poop make up a mini-ecosystem in your aquaponics system. Think of the bio-filter as the motor in your car. It takes up the gasoline that you pour into it and turns it into energy source that powers up your car. The establishment of a bio-filter begins with the introduction of ammonia into the system. This can be done either by introducing fish poop, a source of ammonia or synthetically, in a process called ‘cycling’. Basically, cycling is complete when sufficient bacteria have been established. This bacteria converts all the ammonia in the system to nitrite and subsequently to nitrate, where ammonia and nitrite levels are reading zero. 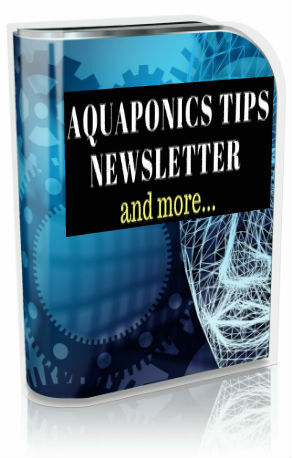 You see, during the initial stages of your aquaponics system, well…the first three months at least, you may only be able to grow plants that require less nutrients, such as salads. But, by the time your bio-filter reaches the maturity of six months, you will be able to grow heavier feeders. This include; cucumbers, tomatoes or even beans depending on the pH of your system. Whether it’s aquaponics, hydroponics or any growing system, pH determines a plants ability to take up nutrients. Every element has a pH where the plant is able to absorb them. If your system’s pH is in the range where certain elements are not able to be absorbed by the plant, then the plant will be deficient of it/them. 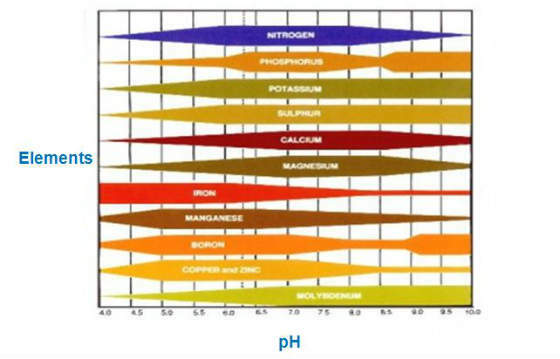 Now, take a look at the chart above and you will see at the horizontal axis is the pH, and at the vertical axis shows the different elements. The thickness of the horizontal lines that represent the different elements reflect the ease of its up-take by plants. For example, if you look at the ‘red’ horizontal line that represents Iron. From the pH of 4.0 to 6.0 its ease of absorbsion is the highest as the line is thickest in this region and weekends as the pH increases from 6.3. So, from the chart, you will see that the sweet spot is between 6.0 to 7.5 where most of the lines are in the thicker region. This goes on to say that if your system pH stays in between this region, your plants will be in the best position to possibly absorb all of the elements they need to grow healthily. Is to find a good compromise of pH level between the plants, bacteria and fish. Typically, bacteria and fish are most comfortable with a pH in the range of 7.0 to 8.0. In order to strike an acceptable level for all the elements involved, I would recommend to maintain a pH of between 6.8 to 7.0 in their aquaponics systems. Well, I do it between 6.8 to 7.5, and this seems to work well for me. My advice is to always accommodate your plants to your natural water pH and only adjust your pH after your system is matured. It will be safer this way. When you want to lower or raise you water pH. The secret is to do it SLOWLY. A shift of no more than 0.2 a day is all the fish can handle. Large pH swings would stress the fish and you may even end up killing them. A safe way to lower the pH is by using a product called ‘AquaDown’. This is commonly sold in most pet or aquarium stores. The important thing to note here is to avoid products that contain citric acid, as this would kill your system’s bacteria. 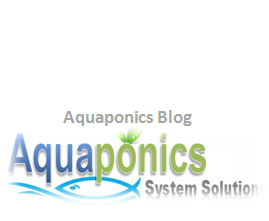 I always recommend a pH Down solution by Aquaponics Source called Aquadown which is safe for aquaponics use. It also supplements your plants with phosphorus as it lowers your pH. You can raise your system pH naturally by using crushed egg shells, sea shells as well as snail shells, but you need to bleach or boil them before-hand to prevent introducing unwanted bacteria into your system. 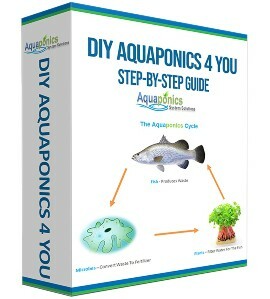 A ‘pH Up’ product that I would not hesitate to recommend is the ‘AquaUp‘ by Aquaponics Source. AquaUp comes with calcium and potassium carbonate mixed into the solution. Two important elements your plants will appreciate. “What you put in, is what you will get out”. This is a policy I always adhere to everything in life. And when it comes to your aquaponics fish, it’s no different. I recommend the highest quality of fish food you can afford for the given fish of your choice. In aquaponics, happy and healthy fish means healthy and tasty produce. Quality fish feed goes a long way in ensuring the healthy production from your aquaponics system for years to come. You don’t or rarely need to supplement your matured system if you feed your fish right, provided you have a system with a 12” deep growbed as recommended in my step-by-step guide to Home DIY Aquaponics package. In fact you may harm your system by adding supplements, mainly because aquaponics is a natural ecosystem by itself. The only things you need watch out for once your system is matured are; manage your oxygen level, pH and water temperature, feed the fish and let it be. I hope this article on aquaponics water chemistry has been helpful. And as always please feel free to like and share the blog post.